Since the 1960s, community groups across Chicago have used vacant or untended lots as opportunities to create open spaces in their neighborhoods. As housing and commercial building increased, green space decreased. In the mid-1990s, studies showed that Chicago ranked 18th out of 20 cities of comparable size in the ratio of open space acres to population. In response, the City of Chicago, Chicago Park District, and Forest Preserve District of Cook County worked together to establish NeighborSpace as a non-profit in 1996 and charged the organization with the mission to acquire such properties and ensure their continued survival. 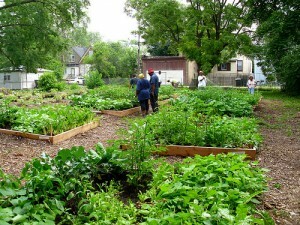 NeighborSpace hosts Englewoodʼs Hermitage Street Community Garden. Englewood has a poverty rate of 42% and an unemployment rate of 21%, and is also food-scarce, with a lack of affordable grocery stores selling fresh produce. Hermitage Street Community Garden currently has twelve raised beds devoted to the food donation program that provides ten pounds of fresh vegetables per family to approximately ten families each week, with a special focus on donating to seniors, veterans, and the homeless. The grant of $5,000 from the CHIditarod helped to pay for seven new raised beds for Hermitage Street Community Garden and for their donation program. This would include the cost for durable cedar timbers, safe soil, and barrier cloth, ensuring that the vegetables grown in these beds will be healthful and pollutant-free. These beds will increase the donation output by 58%, or approximately six boxes of produce a week. That means up to 120 additional Englewood families each year will be receiving a weekʼs worth of free, fresh produce.